It’s only natural for humans to anthropomorphize animals. We want our furry friends to be like us, and we don’t like the idea that something that cuddly and with that much personality doesn’t have a human-like soul. 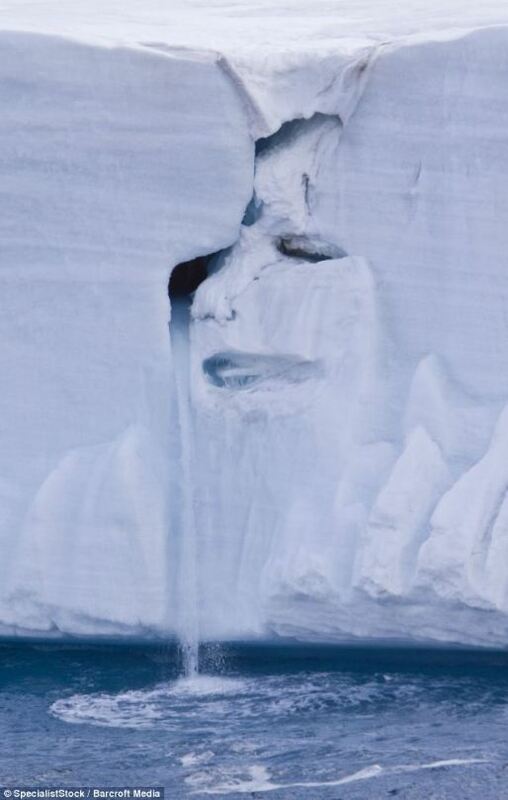 However, why do humans persist in seeing faces where there isn’t really a face, like in the above picture of a crying glacier in the Austfonna ice cap near Nordaustlandet, Norway? In this case, the phenomenon called pareidolia (thanks, Neatorama!) applies because people look at the melting glacier and want to see something symbolic of the global warming crisis. It’s like seeing an angry face in the clouds of a storm or a loaf of bread. It’s there because you want to see it. For everyone else, it’s just some water run-off from a giant block of ice and not a meaningful portrait of a world crying out for us to save it from pollution.